Shropshire Tree Services came to us for their first ever website with the aim of building awareness of their business and winning new contract. 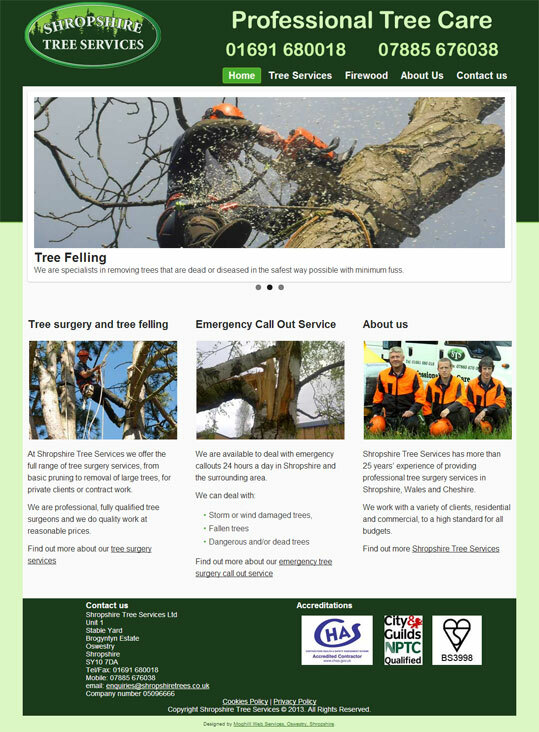 There are a lot of tree surgeons locally and from the start we wanted to build a site that would stand out. The competitor sites had several things in common – they were very wordy (tree surgeons love what they do and like to talk about it) and this makes them difficult to use and a little intimidating. So we built a site that was a straightforward as possible, worded very tightly and easy to use, with a couple of photo galleries to illustrate the work of Shropshire Tree Services. The site is a standard desktop website without a mobile version but still usable on a phone, thanks to its clear layout. We have also provided email services, taking on an existing account, and two other domain names which now point at the new site.